The Live 8 concert on July 2, 2005 held in London’s Hyde Park was one of a string of concerts around the world staged throughout the G8 and South Africa. The concerts were timed to proceed the G8 summit, and were held in conjunction with the Make Poverty History campaign. U2 opened the London concert, and played a set that included “Sgt. Pepper’s Lonely Hearts Club Band” performed with Paul McCartney of the Beatles, “Beautiful Day – Blackbird”, “Vertigo”, and “One – Unchained Melody.” The song “Sgt. Pepper’s Lonely Hearts Club Band” was released for sale as a single within minutes of U2’s performance being finished and it went on to set records for sales that day. This compilation CD was put together for radio stations and reviewers to promote the release of the Live 8 DVD. The four disc DVD set was to be released on November 8, 2005 in the US, and the day prior in the UK. This DVD set was a four disc set, which featured the entire U2 performance, and many of the performances from the UK concert. The promotional CD was released by Columbia records, and featured U2’s performance of “Vertigo” from the Live 8 concert. 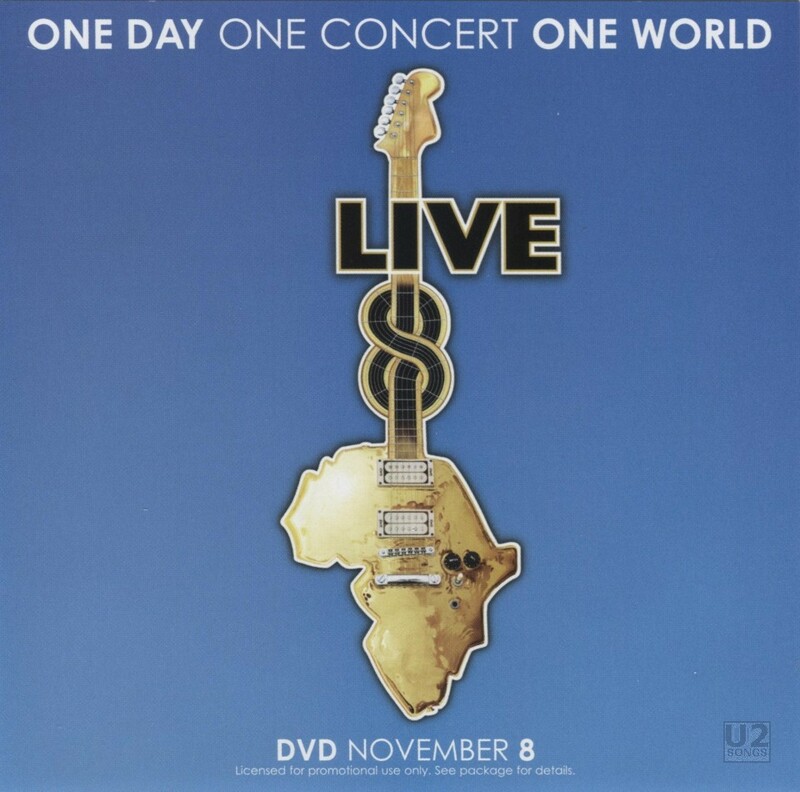 The promotional CD featured five other songs from the performances that day as well, but only the one track featuring U2. As mentioned the track is used in the DVD as well, and in the DVD is edited such that the song is 3:42 in length. Here on this promotional CD the song is slightly longer at 3:50 in length. This is due to the editing of the crowd noise and what is included at the start and end of the track. This CD was produced by Capitol Records, and is released in a regular jewel case, with unique front and back inserts. There was not an audio release of the songs from Live 8 with the exception of this promotional single used to promote the DVD release. No liner notes are included with this promotional CD to list technical details about the songs.